This is a 500 round case load of the Ball M80 clone that CBC of Brazil is producing for the American shooting market. This is a very good round for those who want to plink or shoot targets at under 250 yards. The accuracy is slightly less the focal point than some other dedicated target rounds, but the price point and the build quality is great. The sealed primers and throats, as well as the annealed cases and the full metal jacket M80 projectiles in 147 grains makes this a unique round for the money. It definitely punches above its weight class. CBC is a major producer in the world of shooting, and controls producers that have volume above 2 billion rounds annually. 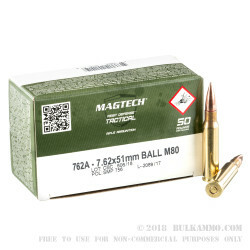 The company serves as the parent company for major ammunition manufacturers including Sellier & Bellot of the Czech Republic; MEN of Germany and Magtech in the USA. Between the 4 companies (and some other assorted smaller producers) CBC is one of the largest companies in the market segment; in the world and the potential for production volume and research and development is immense. 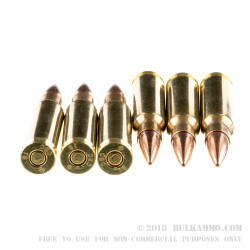 This load is reloadable due to the brass casing and the Boxer primer of the cartridges. It is also sufficiently accurate for normal range duty and plinking. For the money it is hard to beat this option. Shell casings swell and stick in chamber after firing. Maybe brass is too soft. This stuff does not feed or eject worth a darn through my Sig716. I would never buy it again! Q: Hello, what is the general purpose of this bullet? Is it any good for hunting larger game and self defense? Or is it only good for basic, novice target shooting? 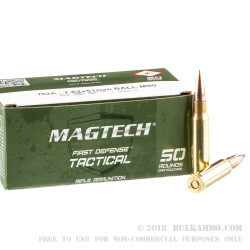 A: While the general design of the bullet on this Magtech ammo is usually applied for target practice and range use, the quality of the rounds would work well for any of the applications you have mentioned including hunting and defense. Depending on the size of the game being hunted, a larger caliber may be needed. Though most small to medium game would not be an issue. For best results in hunting, I would even consider a round with a specialized ballistic tip, or any generic "soft point" tip will work. A specialized tip is usually exclusive to the manufacturer of the ammo. An example of this would be Hornady Vmax. Remington, Winchester and Federal also feature their own plastic or polymer tip.